[Stride]-Stride Step-[Choose one or more cards with the sum of their grades being 3 or greater from your hand, and discard them] Stride this card on your (VC) from face down. [ACT](VC)[1/Turn]:[Choose a face down card from your G zone, and turn it face up] If you have a heart card with "Jewel Knight" in its card name, and if you have three or more rear-guards with "Jewel Knight" in its card name, all of your units with "Jewel Knight" in its card name get [Power]+3000 for each face up card named "Climax Jewel Knight Lord, Evangeline" in your G zone until end of turn. Doesn't leave me with the good kind of climax, unfortunately. This last card of the week needs a Jewel Knight heart. Once per turn, as an ACT skill, you flip any G-Unit in the G-Zone face-up, and then if you have at least 3 Jewel Knight rear-guards, all your Jewel Knights gain 3k for every face-up copy of Evangeline in the G-Zone until the end of the turn. So assuming a pure Jewel Knight board, that's 6k to all columns on the first Stride, then assuming you don't G Persona Blast to pay the cost for the rest of them, 12k on the second, then 18k on the third. Then you've run out of this. That's pretty much how this card is played. Use cards like Swordmy to make a board then drop this card's skill. BTW Conquest clause applies: this won't power up Jewel Knights called after the skill is resolved. So set the board up beforehand. Turns the whole deck into G Neo Nectar without the Early Game restrictions. Not too shabby, considering it's also Counterblast free. I like this, a bit. If anyone has seen or read Negima, the name is appropriate. 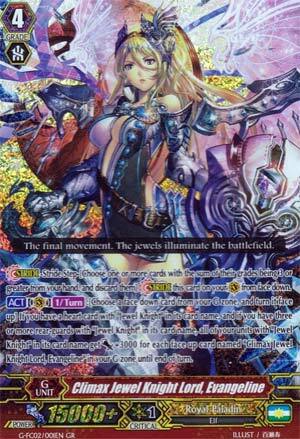 Anyway, Jewel Knight heart needed, flip up a card in your G-Zone, for each copy of Evangeline in your G-Zone, if you have three or more rear guards with Jewel Knight, they all get +3000 per copy that's face up, until end of turn. Yeah, this is super solid. Falls prey to Kagero, Narukami and Link Joker like any Paladin deck, well, any Royal Paladin deck, Shadows tend to be okay with dealing with those clans, but this, I think, is just really good.